RENSSELAER, N.Y. — NYISO on Monday floated a carbon pricing proposal that would leave importers and exporters to manage the risk of predicting carbon charges for real-time imports into New York, rather than saddling consumers with that uncertainty. NYISO staffer Nathaniel Gilbraith recommended to New York’s Integrating Public Policy Task Force (IPPTF) applying carbon charges to external transactions such that they compete with internal resources and each other as if the ISO were not applying a carbon charge to internal suppliers. Gilbraith cautioned adopting a carbon charge without considering the pricing effects at New York’s borders would likely cause large shifts in import and export dynamics because in-state suppliers would carry an additional cost burden not shared by external suppliers. Under the plan, NYISO would base the carbon impact on LBMP (LBMPc) on the real-time system dispatch to determine carbon charges and credits, as opposed to forecasting the impact. The change would be consistent with the LBMPc used to allocate residuals to loads, and the ISO would also create a new billing code for carbon charge settlements. By basing the LBMPc on real-time system dispatch, the ISO would not be required to produce a binding forecast of the carbon impact, and energy traders would bear the risk of carbon impact uncertainty. Several stakeholders took exception to the “big change” in the way the ISO does business, but IPPTF Chair Nicole Bouchez, the ISO’s principal economist, said energy traders would be privy to the same information as the grid operator and have the ability to manage that risk. “Where we landed is that it really wasn’t the best place for consumers to bear that risk because they don’t have the hedges available to [traders] and because the marketers have both the ability to manage the risk and also in many ways the direct incentive to manage that risk,” Bouchez said. With the new separate line item for a carbon charge on bills and invoices, an import will see both a payment equal to the LBMP and a charge equal to the LBMPc, Gilbraith said. NYISO is targeting the Oct. 22 or 29 task force meeting to discuss LBMPc calculation and transparency of data with stakeholders. The study assumed lower-emission dispatch leading to a need to buy fewer renewable energy credits (RECs) to meet the Clean Energy Standard decarbonzaion goals, “so if you get this low-cost emissions abatement through the carbon price, you don’t have to do quite as much higher-cost abatement,” Newell said. The effect is “not very big because it’s assessed at the REC price post-carbon charge, which is quite low, but that’s always been there and it ends up being trivially small,” he said. 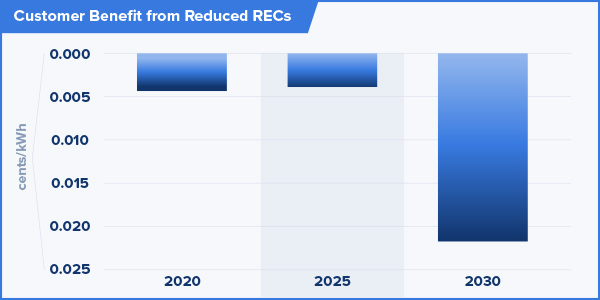 The ISO proposed applying a carbon charge to wholesale market suppliers with active, fixed-price REC contracts with the New York State Energy Research and Development Authority that are based on a REC solicitation that began or was completed prior to the carbon pricing rules taking effect, which the ISO estimates to be the second quarter of 2021 at the earliest. Warren Myers, Department of Public Service director of market and regulatory economics, asked, “If New York doesn’t change its policy and index future contracts, do you think the clawback might have an effect on that discount, on how much of that credit is translated into these future REC contracts? The perception of a double payment is not quite accurate and a clawback carries a lot of potential unintended consequences, Newell said. Newell said including pre-2020 RECs poses questions: Was the REC payment generators were receiving unambiguously just for carbon or for something else? To what extent did the suppliers already offer a lower price because of the potential upside from getting carbon pricing? Rule changes create regulatory risk in general and not just for the next REC payments, he said. “Even if you believe that these REC prices were based on a view of the world that would never have carbon pricing and was fully just compensating them for their non-emitting attributes, the carbon component of the LBMP would be too much to claw back because there are dynamic effects that have already lowered the energy and capacity prices,” Newell said. Michael DeSocio, the ISO’s senior manager for market design, listed the stakeholder requests so far for additional analysis, such as considering assumptions of a higher social cost of carbon or different RGGI values for 2030. The ISO will prioritize the requests and recommend what analyses the task force undertake, he said. The task force next meets at NYISO headquarters Oct. 22 to follow up on the treatment of resources with existing REC contracts and to hear a Calpine presentation on how a carbon charge might affect hedges on transmission congestion contracts.